Colorful Snowflakes ~ Deck your Christmas tree with a color-happy flurry of snowflakes. 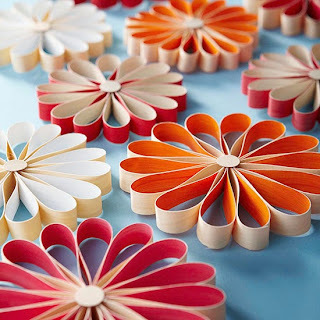 To make, use lightweight wood veneer paper cut into strips to form 14-16 loops per snowflake. To add the bright colors to your snowflakes, paint one side of the wood veneer paper before cutting into strips. Glue together using fast-drying crafts glue to form a circle. Glue circles punched from scraps of the wood veneer to the center. Tie thread through a loop to hang. Star Christmas Ornament ~ Add a festive message to your Christmas tree with our fun-to-make three-dimensional paper star ornament. Pick patterned paper in bright colors to make the Christmas craft stand out when hung on the tree. Learn more about this project. 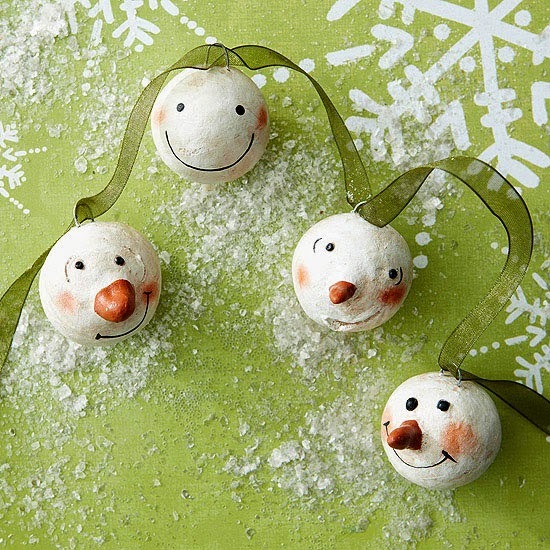 Snowman-Face Ornaments ~ It's easy to assemble a whole garland filled with these happy snowman ornaments. Start with small foam balls; cover with air-dry clay, adding an extra-small amount to each to shape into a nose if desired. Wet the clay to attach black beads for eyes; use a toothpick to draw mouths. Paint facial details with orange paint, or add a bit of cosmetic blush for rosy cheeks. Add a hanger using an 1-1/2-inch-long piece of florist's wire. Seal with clear gloss gel medium or clear glitter paint. Tree Ornaments, Two Ways ~ As ornaments or gift embellishments, little wintry trees add handmade flair. Make the Triangle Tree Ornament: Trace a triangular tree base onto medium-weight wood veneer paper; cut out. Punch holes in the tree shape using various-sizes hole punches. Glue the tree shape to a piece of felt; trim felt edges. Punch a hole in the top and thread string through to hang. 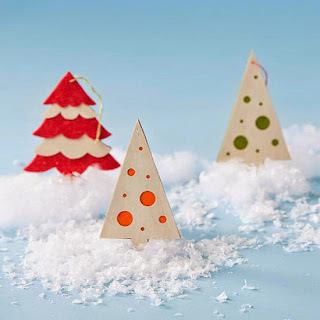 Make the Scallop Tree Ornament: Cut multiple-size triangles from felt and medium-weight wood veneer paper; use scallop-edge scissors to cut along the bottom of each triangle. Glue the scallop-edge triangles to each other, layering from bottom to top. Be sure to alternate between the wood veneer and felt as you go. Use the wood veneer to create a tree base. Punch a hole in the top of the tree and loop thread through for hanging. Two-Tone Felt Tree Ornament ~ For a simply-styled Christmas ornament, our two-tone tree will do the trick. 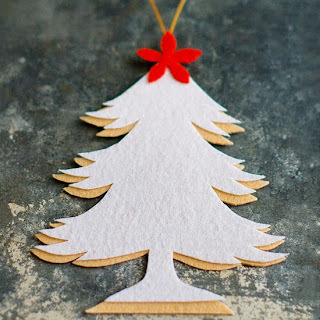 Trace a tree onto stiff felt using a stencil; cut out. Trace an overlay tree onto a contrasting color of felt, cutting it slightly smaller than the foundation tree; glue the two trees together as shown. 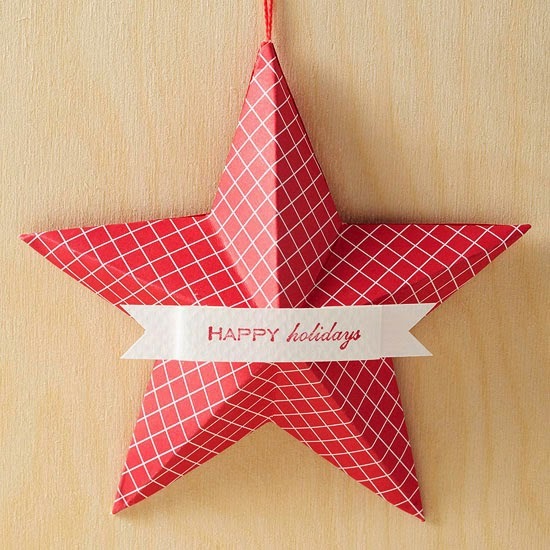 Finish by gluing on a star topper and hot-gluing a hanging loop to the back of the ornament. 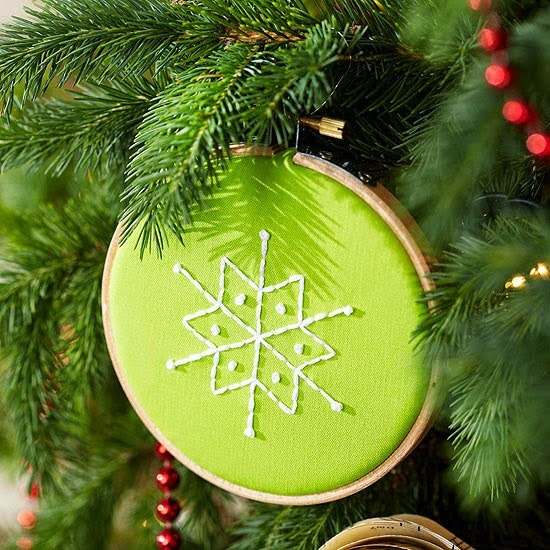 Miniature Embroidered Ornaments ~ Whip up a batch of these mini Christmas ornaments -- hang some from the tree and give a few as gifts, too. Simply trace a design onto a small piece of brightly colored linen or cotton. Embroider the design, then place in a miniature embroidery hoop (use hot glue to seal the edges).